The timeline for acceptance has advanced swiftly since then, with women breaking through barriers to attend service academies, fly and serve in combat, serve on submarines and in infantry units, attend Ranger school, and finally, allowed promotion to leadership positions across the board. 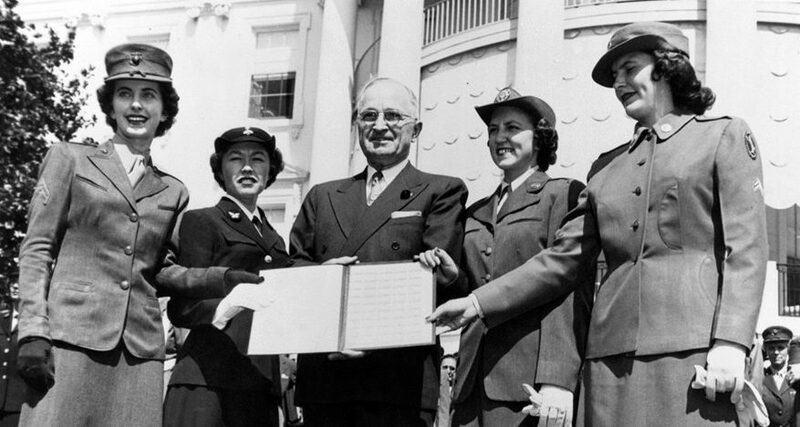 We read the articles every day about the “firsts” that service women are still accomplishing. However, some women still do not self-identify as Veterans, perhaps since women did not receive full Veteran status till the 1980s. The Center for Women Veterans was created 24 years ago to advocate on behalf of women Veterans, and we are working diligently to identify and eliminate disparities between women and men in their access to care and benefits at VA; to change the culture to make it a more welcoming place for all those who shall have borne the battle and to transform and modernize the department to serve the fast-growing Women Veteran population. We are actively engaged in campaigns for cultural transformation within VA and beyond to ensure you will be recognized and treated with the dignity and respect you have earned, using campaigns like the Women Veterans Art Exhibit, the Women Veteran Athletes Initiative, and the I Am Not Invisible photo gallery. We’ve completed groundbreaking projects, like the first Nationwide Baby Shower, a two week span in which we held 62 baby showers for 2,500 new Veteran-parents-to be at VA Medical Centers across the country. These landmark events allowed us to provide education, resources, and even more important, local community connections to women Veterans in the same stage of life. Some said it was the first time they’d ever met another pregnant woman Veteran. In another first, the center launched Facebook and Twitter accounts (@VAWomenVets) in order to promote gender-specific articles each and every day to a population thirsting for information and insight. We also send out a weekly bulletin with news, resources, research, and events to cross-promote all of the awesome things women vets are doing across the country. We are highlighting the Million Veteran Program, because we know that women are not just mini-men, and we need and deserve to study the effects that military service has on our bodies, and our offspring. There are currently two breast cancer studies going on at the VA, and we hope others follow. We are focusing on suicide prevention through constant outreach and encouraging enrollment in VA – we know that women Veterans who engage with VA are far less likely to commit suicide. We are promoting the Women Veterans Call Center (855-VA-Women), a call center staffed completely by women, half of which are women Veterans, that can make internal referrals to the appropriate parties, as well as register care complaints for inequitable treatment. They also make outbound calls to women vets to inform them of their eligibility for care and benefits. We are supporting programs that build women-vet-centric community groups, both in-person and online, through nationwide MOUs and strategic planning, because we know we are stronger together as a connected and informed community. And we are showing up in as many places as we possible to hear directly from the women vets we serve – and using these grassroots discoveries to drive effective policy and programming. Join us as we celebrate the last 70 years of accomplishments, and continue our march towards full and equal recognition. Danielle Corazza is the national outreach coordinator for the Center for Women Veterans, where she focuses on serving women Veterans through digital and in-person events. As the daughter of two Veterans and a US Army service-disabled Veteran and caregiver herself, she brings a lifetime of experience to her work advocating for those who served. I served my Country from 1963 to 1966 and was never recognized as a women Veteran until the early 1990’s how can you say were recognized a veteran I also had an Aunt who served in WWII who was never recognized. The VA has been very discriminating to our Gender. how can you say we were recognized all the way backed to 1948? Excellent article, enjoyed meeting you when you spoke at Craven County Women Veteran Luncheon in June. Keep up the good work on our behalf. I appreciate all those who have served it was their honorable service that allowed me to have my 24 year career in the USN. So proud to be a woman Veteran. I have much respect and gratitude to the women that have served our country, before me. They certainly broke through barriers and paved the way for us all. It was an honor to serve and a privelage, as well.